We’ve never cared for helm mounted chartplotters so we have a simple helm mounted GPS. The GPS is an old Garmin GPS-128 with the antenna mounted on a backstay. 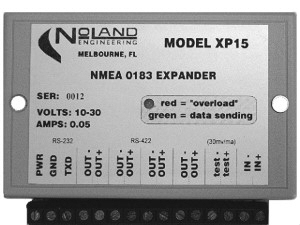 Data from the GPS is sent via a Noland Engineering XP15 NMEA Expander to the Boat PC (serial port), to the B&G Autopilot Computer (NMEA in), and to an auxiliary port at the Nav station. The expander isolates the GPS transmit data stream so that a failure at any one of the downstream devices will have no impact on any of the other devices.